for the first Die Brucke art show. For different forms, see: Types of Art. In fine art, the term lithograph or lithography comes from Greek, meaning 'writing with stone'. It was invented in 1798 by German Alois Senefelder (1771-1834), as a way of printing text, in particular his own plays. Lithography is a popular planographic (surface-printing) technique based on the immiscibility (chemical repulsion of) oil and water. Senefelder patented the process in 1798 and his first publication was a set of drawings by Swiss naturalist Conrad Gessner (1516-65) in London in 1799. The lithographic process was kept top secret until 1818, when Alois Senefelder published Vollstandinges Lehrbuch der Steindruckerey (A Complete Course of Lithography). A modern variant is photo-lithography, which employs photographic processes to capture the image on metal plates. Lithography quickly became popular with artists as a means of reproduction. The artist simply drew a picture on a stone, which was then pressed to reproduce lots of copies on paper. Senefelder continuously improved the process during his lifetime, receiving awards and medals for his work. The first collection of lithographs was published in London in 1803, and included works by American artist Benjamin West (1738-1820), Irish painter James Barry (1741-1806) and Anglo-Swiss artist Henry Fuseli (1741-1825). In 1804 the first series of lithographs in Berlin were published, and included a drawing by the architect Karl Friedrich Schinkel (1781-1841). In France the process proved popular with some of the country's most important artists including Eugene Delacroix (1798-1863), Theodore Chasseriau (1819-1856), Theodore Gericault (1791-1824) and the aged Goya (1746-1828). By this time the process had been further developed and it was now possible to give both colour and tone to a lithograph. It was discovered that every colour could be produced by overlapping blue, red, yellow and black. Note: For other forms of fine art print processes, see: Woodcuts (oldest printmaking technique), Engraving (derived from Goldsmithery techniques), Etching (important intaglio method), Silkscreen Printing (popularized by Warhol), and Giclee Prints (Inkjet printer). Photo-lithography, which is the process of making a lithographic printing plate by photographic means, was the next important progression. It was invented in 1855 by the French chemist Alphonse Louis Poitevin. Other inventions included halftone photographic printing and process colour printing. Combined, they were all important steps in the history of lithography, and also book and magazine illustration. However, they were not put to much practical use due to the limitation of the lithographic press itself. That was, until the addition of the offset press, which made the process faster, cheaper and more reliable. Two versions of the offset press were invented: In 1875 Robert Barclay, England created a version for printing on tin, and in 1903 the American Ira Washington Rubel created a version for printing on paper. In the beginning limestone was used for the plates, but these have since been replaced by metal plates. The stencils or images are designed using photographic plates and the printing is carried out using a 3 roller offset press. Lithographic printing has progressed a long way from its point of origin. Note: For terms relating to engraving, etching, lithography, woodcuts and screenprinting, see: Printmaking Glossary. In this printmaking process, the artist draws the desired image on a flat stone surface, using a greasy litho crayon or a greasy black ink (tusche) - note: the word lithography derives from the Greek 'lithos' meaning, stone. Limestone is usually the preferred surface for fine art, but zinc and aluminium plates are also used. When the drawing is completed, it is 'fixed' with an etch (a heavy syrupy mix of gum arabic and a small quantity of nitric acid) to prevent the grease from spreading. In addition, the nitric acid opens the pores of the stone, enabling the gum and grease to enter easily. Meanwhile, the gum arabic surrounds the greasy areas, sealing it against the water applied during printing. Because of the mutual repulsion of grease and water, the image attracts the oily ink but repels water. Thus, when the surface is moistened and inked, the ink adheres to the greasy drawing and not the wet stone, and is transferred perfectly to paper. Indeed, lithography is noted for its ability to capture fine detail and subtle differences in shading. Lithography instantly became a popular form of graphic art with painters during the mid-1800s, including the Spaniard Goya, and the French artists Gericault and Delacroix noted for his equestrian lithographs. The draftsman Honore Daumier was more prolific, being one of the first artists to use transfer-lithography, by which the tusche drawing is made on paper instead of on stone. He proved a great influence on subsequent exponents like Whistler (1834-1903). Another American exponent of lithographic art was Winslow Homer (1836-1910). Later in the 19th century, the Impressionists Edouard Manet (1832-83), Odilon Redon (1840-1916) and Edgar Degas (1834-1917), as well as Henri Fantin-Latour (1836-1904), also adopted this print method. Although lithography was invented in 1798, for the first many years it was too expensive a process to be used for poster art. Most posters in the beginning were woodblocks or metal engravings which contained little or no colour or design. This changed when it was discovered that all colours could be produced with as little as four stones, yellow, blue and red, and tones with the addition of black. Although the process was initially difficult, it produced some of the most powerful, luminous images which are still difficult to rival today. The ability to combine colour, image and text on one surface, made the lithographic poster one of the most powerful means of communication in late 19th century, early 20th century Europe and America. However, it only truly became popular as an art form after the French printmaker Jules Cheret (1836-1932) invented his "3-stone chromolithography". This invention helped to transform the streets of Paris, New York and London into art galleries. By 1890, during the Belle Epoque in Paris, poster art was in full bloom. 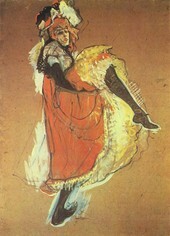 In 1891 Toulouse-Lautrec's (1864-1901) poster La Goulue, Moulin Rouge elevated the status of poster art to fine art. In 1894, the Cezech lithographer Alphonse Mucha was creating the first masterpieces of Art Nouveau posters. His fame was secured almost overnight by his lithographic poster of Sarah Bernhardt. Art Nouveau displayed a mix of influences including Pre-Raphaelites and Byzantine art. By the turn of the century, exhibitions of poster art were being held across Europe. Toulouse-Lautrec was followed by other Post-Impressionists like Paul Gauguin (1848-1903), and the Nabis Pierre Bonnard (1867-1947), and Edouard Vuillard (1868-1940). At the start of the 20th century, poster art was continued by a new generation of artists including Leonetto Cappiello (1875-1942) and A.M. Cassandre in Paris, Lucien Bernhard in Berlin and Ludwig Hohlwein in Munich. The styles developed, encompassing propaganda art, Futurism, Constructivism, Cubism, Dada, and Art Deco. By the Second World War, posters were more commonly being printed by a mass production technique which involved using photos rather than artistic designs. By the 1950s lithographic posters had virtually died out. In the 20th century, the Norwegian Edvard Munch (1863-1944), as well as expressionists like Max Beckmann (1884-1950) and Ernst Kirchner (1880-1938) became avid lithographers, as did the French painters Henri Matisse (1869-1954) and Georges Rouault (1871-1958). Among modern artists, lithography was utilized by artists like Andy Warhol (1928-87), Stow Wengenroth (1906-78), Willem de Kooning (1904-97), Rockwell Kent (1882-1971), M.C. Escher (1898-1972), Ben Shahn (1898-1969), David Hockney (b.1937) and Robert Rauschenberg (1925-2008), who all imbued the medium with great vitality.  For more about etching, engraving, lithography, silkscreen or giclee prints, see: Visual Arts Encyclopedia.